Thanks for your script submission. To complete the payment process please press 'Add to Cart' button on the right, proceed to checkout, and pay as normal. If you want custom recordings in more than one language simply download the script template and resubmit for each language. You can pay for all of them at the same time but adding each to the basket and proceeding to checkout when you are complete. Once your recordings are complete they will be uploaded to a secure folder on the website, ready for download. They will be transcoded into the list of formats on the right. If you want them in any additional formats let us know. As soon as they are complete you will receive a download link via email. 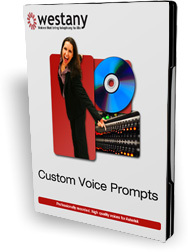 We usually bring the voice artist into the studio on the same day as we receive your order. Depending on the size of the order, we aim to get the final recordings back to you the same day if we can. It can be delayed if we receive the order on a weekend, a holiday or too close to the end of the day. After the script has been recorded, edited and tested it will be compressed and uploaded to a protected web folder for you to download. You will receive an email with the download details and a quick ‘single click’ link that will initiate the download from you. We don’t send them via email as the compressed files are quite large. © 2006-2018 WESTANY LTD. ALL RIGHTS RESERVED.